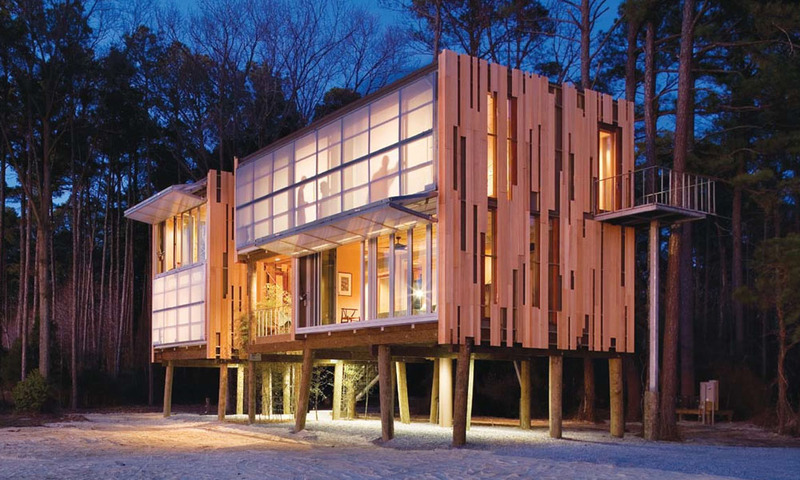 Loblolly House on Taylors Island, Maryland is a 2,200-square-foot prefab house composed entirely of fabricated components made off-site. Designed by Kieran Timberlake Associates, this contemporary home named for the tall loblolly pines that characterize its site on the Chesapeake Bay was built in environmentally ethical ways. There is minimal disruption to the ground with the house resting lightly on the site using timber piles as foundations. Architects Stephen Kieran and James Timberlake believe that the construction process today should be streamlined, so they boldly took on the project which has become a model for componentized prefab houses.